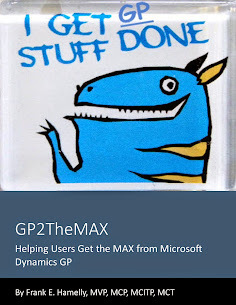 GP2TheMAX - Helping users get the 'MAX' from Dynamics GP: Microsoft Dynamics Mayhem!! Packt Publishing is crowning February, Microsoft Dynamics Mayhem, and celebrating its range of Dynamics books/e-books with exciting discounts. As the leading publisher of Microsoft Dynamics books/e-books and a multitude of bestsellers on NAV, AX, GP and Sure Step, not only do these titles excel in terms of quantity, but in quality, with each book garnering numerous positive reviews. To celebrate this achievement, Packt has slashed cover prices by up to 30%, so go mad, go crazy and make the most of this mayhem. Throughout 2012, Packt will continue to build-upon this success, with a focus on branching into different forms and formats such as a Dynamics Certification series.